Directorate for Project Management of the Ministry of Defence of the Republic of Serbia informed foreign military representatives about its functional competencies and most important projects. Today, the Directorate for Project Management of the Ministry of Defence of the Republic of Serbia informed foreign military representatives about its functional competencies and most important projects. In his opening word, Deputy Minister of MoD for Budget and Finance Srbislav Cvejić thanked the guests, on the behalf of the Ministry of Defence, for previous understanding and donor assistance and said that the Ministry of Defence is a complex and highly accountable system. – For that reason, its continuous organizational improvement and structural upgrade are necessary. We want to focus our activities on modern functional and technological project support to structures of the Ministry of Defence and Serbian Armed Forces in order to implement the priority objectives related to the modernization of our defence system – said the Deputy Minister. Director of the Directorate for Project Management, Mr Proda Šećerov, presented the new structure of the Ministry of Defence to foreign military representatives and introduced new members of staff who are facing new challenges and responsibilities and who, in short period, managed to prepare about 20 projects, 4 of which were presented that day. – Key functions of the Directorate are project planning and preparing, submitting applications to the competent institutions in the country and abroad, as well as implementing and monitoring of approved projects – said Mr Šećerov. He also said that one of the goals of today’s presentation, which was attended by State Secretary Zoran Đorđević, was to show continuity of structural changes in the Ministry of Defence since July 2012. 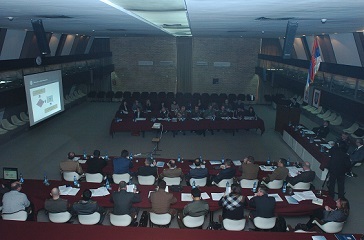 The following projects were presented to foreign military representatives: Improvement of office administration in MoD and SAF using modern information and communication technologies (EDMS), Improvement of infrastructure in the main internet centre of MoD and SAF, Improvement of capacities of NBC (Nuclear Biological Chemical) Defence Training Centre MoD RS, and the bioterrorism project. The guests were most interested in projects on bioterrorism and informative technologies and said that information they heard that day was very useful to them. Defence attaché of the Swiss Confederation vice doyen colonel Markus Vidmer thanked the host for systematic information on projects. He expressed his hope that those projects would have support of partner countries and he wished a lot of success in further work of the Directorate. At the end, the State Secretary Zoran Đorđević greeted foreign military representatives and said that this meeting was of great importance for the Ministry of Defence because a number of projects which are planned to be implemented were presented that day. He expressed his hope that this cooperation on implementation of significant projects would be continued to mutual benefit.